As was noted in a slightly revised version of On Full Display: The Modernist Mind two days ago now, the false "pontiff," Joseph Ratzinger/Benedict XVI, was busy serving as the master apologist for conciliarism's embrace of one false religion after another right up to the point of his departure from Portugal for Rome. This is not an accident. "All the invocations of the pagans are hateful to God because all their gods are devils." Yet on May 5, 2004 — the Feast of Pope Saint Pius V — the Little Chapel of the Apparitions at Fatima was allowed to be used for a pagan Hindu ceremony. This Little Chapel (also called the Capelinha) is built on the site where Our Blessed Mother appeared to the 3 children of Fatima in 1917. News of the Hindu worship service at Fatima was broadcast on May 5 on SIC, a national television station in Portugal. CFN spoke with two people in Portugal, independent from one another, who saw the televised newscast. The May 22 Portugal News also reported on the event. 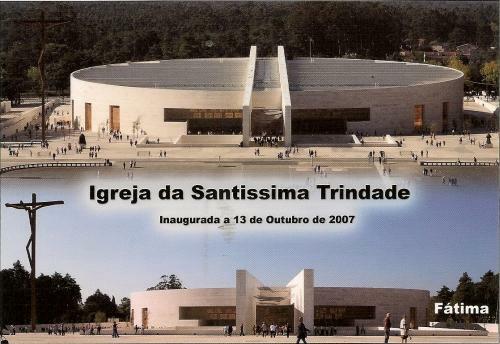 According to the broadcast, a busload of Hindus were allowed to commandeer the sanctuary inside the Fatima Capelinha and to use the Catholic altar for their rituals. The SIC newscaster said, "This is an unprecedented unique moment in the history of the shrine. The Hindu priest, or Sha Tri, prays on the altar the Shaniti Pa, the prayer for peace." The outrage occurred with the blessing of Shrine Rector Msgr. Guerra. No one may use the Capelinha without Rector Guerra’s permission. The Hindus wore traditional garb, a Hindu "priest" in traditional Hindu vestments led the ceremony that consisted in the offering of flowers and food. This would seem to indicate that the Hindus performed their pagan puja, a ritual in which the offering of flowers and food is central. After the Hindu worship service at the Catholic altar, the Hindus were escorted by Fatima authorities to see a model of the huge, round-shaped modernistic shrine at Fatima now under construction, a fifty million dollar eyesore that will blot the landscape of Our Lady’s apparitions. One of the Hindus is reported to have said that they go to Fatima because there are many gods, and the gods have wives and companions who will bring good luck. This is a blasphemy against the Queen of Heaven as it places Our Blessed Mother on the same level as some sort of "wife" of a false god. Thus, the Hindus did not even come to Fatima to learn of, or take part in, Catholic prayer. Rather, they folded the holy event of Fatima into their own superstitions and pagan myths. These Hindus are said to be from Lisbon, where they have a Hindu temple and a community of a couple hundred. The SIC broadcast showed the Hindus’ house of worship that contained the many statues of their gods and goddesses. It is reported that pilgrims who witnessed the event at Fatima were scandalized, but Shrine Rector Guerra defended the use of the Marian Shrine for pagan worship. 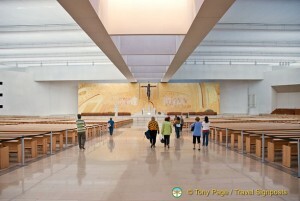 The new Church of the Most Holy Trinity in Fatima has decidedly"ecumenical orientation." The following photographs of the new Church of the Most Holy Trinity could pass for any other monstrosity built to conform what purports to "Catholic worship" in the counterfeit church of conciliarism to the "new orientation" of conciliarism itself. Roger "Cardinal" Mahony, who built the $200 million Taj Mahony on the Hollywood Freeway eight years ago now, could not have conjured up a more fitting expression of conciliarism's view of "Catholic worship" and of "Catholic faith:"
It made perfect sense, therefore, for Ratzinger/Benedict, as a careful deconstructionist of truth and a devoted architect and propagator of the false religion of conciliarism, Modernism's child by way of his own "New Theology," to weave a tapestry of conciliar themes throughout the course of his four-day pilgrimage to Portugal, careful as he was to speak about penance and prayer and to make a gratuitous reference to the Triumph of the Immaculate Heart of Mary even though he does not believe that that triumph has anything to do with a true pope's consecration of Russia to her Sorrowful and Immaculate Heart with all of the world's bishops. Harmony and genuine cohesion as the "only way to address the challenges" before Portugal"with shared responsibility"? For this to be so, of course, Catholicism must not the one and only foundation of personal and social order. Harmony and genuine cohesion as the "only way to address the challenges" before Portugal? By separating fraternity from Christian charity thus understood, Democracy, far from being a progress, would mean a disastrous step backwards for civilization. If, as We desire with all Our heart, the highest possible peak of well being for society and its members is to be attained through fraternity or, as it is also called, universal solidarity, all minds must be united in the knowledge of Truth, all wills united in morality, and all hearts in the love of God and His Son Jesus Christ. But this union is attainable only by Catholic charity, and that is why Catholic charity alone can lead the people in the march of progress towards the ideal civilization. For all of this to be so, of course, the man who believes himself to be a true and legitimate Vicar of Our Blessed Lord and Saviour Jesus Christ would be fully justified in believing that he does not have an obligation to seek with the urgency the unconditional conversion of all non-Catholics to the true Faith. He is not. He stands contradicted by the Apostles themselves, starting with Saint Peter, who sought the conversion of the Jews gathered in Jerusalem on the first Pentecost Sunday, and continued by the great missionaries and our true popes right until the death of Pope Pius XII on October 9, 1958. Catholics attached to the counterfeit church of conciliarism pay attention to the words and the deeds of the conciliar "popes." Even those Catholics who do not bother to participate actively, fully and consciously in the Protestant and Masonic Novus Ordo Service are taught by the example of the conciliar "popes." They have seen Karol Wojtyla/John Paul II sit as an "equal" with leaders of various false religions. They have seen Joseph Ratzinger/Benedict XVI personally esteem the symbols of five false religions with his own priestly hands in full violation of the First Commandment. They have seen Ratzinger/Benedict call mosques "sacred." They have seen him enter mosques and remove his shoes so as to signify being in a "holy" place. Some might have read of how he called Mount Hiei in Japan "sacred" as it is where the Tendei sect of the diabolical religion known as Buddhism established its "first stronghold." Only someone who is wilfully blind or engaged in the worst kind of intellectual dishonesty can deny that the actions of the conciliar "pontiffs"--and the de jure and de facto pastoral praxis of their conciliar "bishops"--have left the impression with billions of people worldwide that the "Catholic Church" believes now that "it doesn't matter what religion you belong to as long as you are a good person. All religions are equal in God's eyes. Everybody goes to Heaven except Bishop Richard Williamson." A Roman Catholic schoolgirl has been labelled a truant after she refused to wear a headscarf during a compulsory trip to a mosque. Amy Owen, 14, and fellow girl pupils at a Catholic secondary school were told to cover their heads and wear trousers or leggings out of respect for their Muslim hosts. But when her mother objected, saying she did not want her daughter to 'dress as a Muslim', she received a sternly worded warning letter from the headmaster saying she had no choice. Peter Lee, head of Ellesmere Port Catholic High School in Cheshire, informed her that the local diocese 'requires' pupils to have an understanding of other religions. In the letter - with words in block capitals and underlined - Mr Lee said the visit was 'as compulsory as a geography field trip'. He added: 'There are two reasons for these visits. One is that the scheme of work in religious studies REQUIRES children to have knowledge and understanding of other world religions. 'The second is that the school is REQUIRED to promote tolerance respect and understanding. This is known as community cohesion. 'A failure to do this could result in an unwelcome inspection judgement. None of us would relish that. Amy's mother Michelle Davies refused to back down and, after being told no teachers would be back at school to keep an eye on her daughter, she kept her at home, citing religious objections - as did as many as ten other families. Yesterday, after the school acted on its threat to class Amy's absence as truancy, Miss Davies accused it of discriminating against Christian pupils. 'It's like they're putting a gun to your head - either you go to a mosque, or you're marked down as an unauthorised absence on your record - that's it no two ways about it,' the 34-year-old said. 'It's like they are saying she is playing truant for not wearing a head scarf. If the trip had been without the leggings and the headscarf, that would have been fine but I wasn't having my daughter dressed in the Muslim way. 'She's proud of her school uniform and what it represents and she should be able to wear it like she would on any normal school trip. 'She likes to learn, she takes history and she is really interested in it, she wants to learn, but she can do that her classroom without changing the way she dresses. 'I even did some research on the internet about non-Muslims attending mosques and it says you don't have to adhere to the dress code. 'I also fail to see how a three-hour trip to a mosque is of any educational value to a Catholic when she can learn about the Muslim faith in the classroom. Parents were asked to make a £3 payment towards the Year 9 trip to the Al Rahma Mosque in Liverpool last month, and an 11-point dress and behaviour code from the mosque was circulated. "Wider cultural development" So much for the English Martyrs who did consider it necessary to betray the Catholic Faith because of such things as "unwelcome inspection judgements." Such is the madness of political correctness in the world, a political correctness that has been spread by the "popes" and the "bishops" of the counterfeit church of conciliarism, that it is increasingly the case that school districts throughout the world require students to "learn" about every false religion in the world with a view to inculcating Modernity's anti-Incarnational madness of "diversity" and "toleration" and "respect" for that which is of the devil himself. The terrorists practice a fringe form of Islamic extremism that has been rejected by Muslim scholars and the vast majority of Muslim clerics -- a fringe movement that perverts the peaceful teachings of Islam. The terrorists' directive commands them to kill Christians and Jews, to kill all Americans, and make no distinction among military and civilians, including women and children. . . .
As we know, these men belonged to al Qaeda – a group of extremists who have distorted and defiled Islam, one of the world's great religions, to justify the slaughter of innocents. Al Qaeda's base of operations was in Afghanistan, where they were harbored by the Taliban – a ruthless, repressive and radical movement that seized control of that country after it was ravaged by years of Soviet occupation and civil war, and after the attention of America and our friends had turned elsewhere. This kind of insane political correctness, which is practiced also on occasion by Joseph Ratzinger/Benedict XVI, keeps American policymakers from admitting that Mohammedanism of its demonic nature is an assault against God and seeks to destroy those who will not follow its false "god" and its false teachings, therefore predisposing them to let domestic terror cells form in the United States of America as a result of immigration laws based on political correctness and electoral self-interest. Weak, cowardly American politicians have made this country unsafe by their refusal to keep out those who seek to dominate here as they are now dominating throughout parts of Europe. Attorney General Eric Holder hesitated to answer whether radical Islam was even a motivating factor for the individuals responsible for the Fort Hood shooting, the attempted Christmas Day bombing and the attempted Times Square attack. The question as to whether the individuals were incited by radical Islam came from the committee’s ranking member Rep. Lamar Smith (R-Texas). The attorney general added that law enforcement would seek to find out from a terror suspect if others are involved, if al Qaeda is involved. “These are all questions we think can be appropriately asked under the public safety exception,” Holder said. Democratic lawmakers cast skepticism on Holder’s proposal to reform the use of Miranda warnings when prosecuting terror suspects. The idea – not yet a formal proposal – would be a near about face if the Obama administration proceeds. Holder first began talking about the change in Miranda warnings during Sunday morning interview programs, in the context of the attempted terrorist attack on Times Square in New York. This came after Holder and the Obama administration spent months defending the use of Miranda warnings against the suspected terrorist in the attempted Christmas Day bombing. “As Attorney General Holder has said and has proven, and former Bush counterterrorism advisor Richard Clarke has agreed, the current system has worked effectively,” Conyers continued. “For example, the attempted Times Square bomber was interrogated using the existing public safety exception, and reportedly has provided extremely valuable information both before and after receiving Miranda warnings. Attempting to hastily alter an effective and constitutionally based system could actually undermine rather than enhance law enforcement efforts,” he added. However, given the administration’s poor record in pouncing on terrorists, such a reversal was unexpected, Smith said. “Treating terrorists like common criminals makes Americans less safe,” Smith said. “Giving terrorists the ‘right to remain silent’ limits our ability to interrogate them and obtain intelligence that could prevent attacks and save lives. Holder boasted about the effectiveness of the criminal justice system in capturing Shahzad, the suspect charged in the attempted Times Square attack. Holder said the Shahzad’s arrest for the attempted Times Square attack is just the most recent action in a string of arrests by the Justice Department. Holder praised the department’s fight against terrorism. In January 2009, 14 people were charged in Minnesota in connection with travel to Somalia to train and fight with terrorist groups in Shabaab. David Headley was convicted of plotting to bomb a Danish newspaper and for his involvement in the Mumbai terror attacks in 2008. Also, Holder cited that Christmas Day underwear bomber Umar Farouk Abdulmutallab was charged with attempting to explode a passenger jet over Detroit. Finally, he pointed to the February conviction of Najibullah Zazi for conspiracy to use weapons of mass destruction in trying to blow up the New York subway system. But Smith contended that the administration’s record is nothing to be proud of. There is, of course, no such thing as "radical Islam," only the violent teachings of the evil Koran itself, something that those imbued with the conciliar madness of "cohesion" and "solidarity" and "inter-religious" dialogue. Sending Catholic schoolchildren to a mosque in England can't paper over the truth of what Mohammedanism is: a violent assault upon the honor and glory and majesty of the Most Blessed Trinity. As much as I empathize with the parents in England who objected to their children being forced to dress as Mohammedans to enter a place of false worship, they really have no basis to protest the actions of Peter Lee, the head of Ellesmere Port Catholic High School in Cheshire, England, when their "pope" has no objections to taking off his shoes in mosques or to listening politely--and with a smile, no less--to songs sung in Talmudic synagogues that deny the Sacred Divinity of Our Blessed Lord and Saviour Jesus Christ. How can well-meaning parents of students at the Ellesmere Port Catholic High School in Cheshire, England, object to "community cohesion" when the "pope" spoke about "cohesion" and "fraternal solidarity" just before he left Portugal two days ago? Obviously, the parents of the students in Ellesmere Port Catholic High School in Cheshire, England, are thinking as Catholics, not conciliarists. They know that the First Commandment forbids us to esteem false religions or to enter their places of false worship. We must pray that they will come to recognize that conciliarism itself is a false religion and that they should flee from it as strongly as they desire to protect their children from a "field trip" that is nothing other than an exercise in rendering honor and respect to the devil in one of his many false religions. And if Mr. Peter Lee desires to teach his children about the diabolical religion known as Mohammedanism perhaps he should turn to one of his own late countrymen, Hilaire Belloc, whose The Great Heresies book contains a very complete description of this false, blasphemous religion. May Our Lady help us to prepare for the celebration of Pentecost Sunday a we call upon her Divine Spouse, God the Holy Ghost, to help us recognize how our own sins have contributed mightily to the state of confusion that is upon us. May our fervent praying of Our Lady's Most Holy Rosary help us to be every ready to sacrifice everything, including our very lives, in defense of the Holy Faith..
Saint Ubaldus, pray for us.